Lateral Property Group has exchanged contracts to acquire a prominent vacant retail unit in Harrogate. Lateral is in discussions with a number of prospective retailers who have shown interest in taking a lease at 6 Cambridge Crescent, currently occupied by Yorkshire Building Society, which is relocating elsewhere in the town centre. An independent survey last month (March ) carried out by the Local Data Company showed that the footfall count for Cambridge Crescent was 56 per cent higher than Harrogate’s prime quality fashion pitch on James Street. Harrogate’s retail economy continues to go from strength to strength. Over 25 new high end retailers have come to the town in recent years including Whistles, Jigsaw, Molton Brown, Apple, Joules, Mint Velvet and L’Occitane, to name but a few. 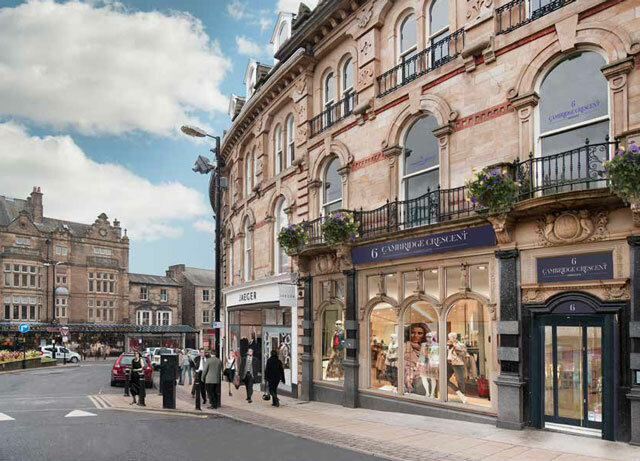 6 Cambridge Crescent has a beautiful façade and will provide an opportunity for those retailers keen to join the quality brands already represented in Harrogate. Lateral Property Group has recently secured planning consent for the transformation of Parliament Street into a quality dining destination with a stunning new façade for Harrogate House, a relic from the 60s. Jamie’s Italian is anchoring this development. SGM and Bruce Gillingham Pollard have been appointed letting agents for Cambridge Crescent.